This is a very weird year in Stratford because most of the really good productions are musicals. North America’s most prominent Shakespeare company usually does fine musicals and great Shakespeare, but Pirates of Penzance and Wanderlust are two of the only highlights of this season (Charlie Brown is good, but not a standout). I was pretty sure 42nd Street would be the one to break that trend since it’s one of those substance-less tap-heavy musical comedies that feels forever dated. It also stars Cynthia Dale, Stratford’s musical theatre leading lady of years passed, the years in which Stratford musicals were particularly mediocre. She’s grandiose and posturing and does a weird thing with her voice that hides the lyrics under show-off vibrato. But 42nd Street defied my expectations- It’s exactly what I was expecting it to be, except that it’s wildly entertaining. First off, despite the advertising, it doesn’t actually star Cynthia Dale. It stars Jennifer Rider-Shaw with Dale in the supporting role of washed-up starlet Dorothy Brock. 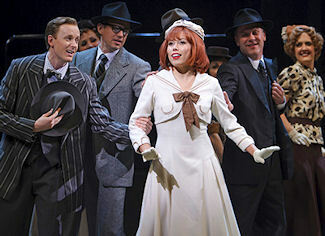 It’s the perfect part for Dale whose showboating undermines the sweetheart roles (like Guinevere and Sara Brown) but makes brassy roles sparkle (like Reno Sweeney- her best performance at the festival). Rider-Shaw, for her part, is a knockout dancer and a pretty good singer (does anyone else remember her from season two of the late-great reality show Triple Sensation?). She’s not as gleamingly charming as last year’s Guinevere (Kaylee Harwood) or as comically rambunctious as Amy Wallis (who’s doing Sally in You’re a Good Man, Charlie Brown and, more impressively, Mabel in Pirates of Penzance), but Rider-Shaw holds down her uncomplicated and wide-eyed part well and sets up her costars for success in the more interesting roles around her. Perhaps the most interesting of those roles is Julian Marsh, the ambitious producer behind the show-within-the-show. As played by the Great (capital letter necessary) Sean Arbuckle, Julian is entirely more fascinating than he’s written. He lives and breathes the show he’s working on but doesn’t have the talent to save it himself (though Arbuckle’s voice is plenty pretty). He walks the line of smarmy/sweet and is an ends-justify-the-means guy with a way with words that rivals most. Arbuckle captures all that, even that which may or may not be written in, and adds perfect character-defining details like the way he surreptitiously conducts while sitting in the audience and watching a scene rehearse (I happened to be in the seat right next to him and caught that little detail that’s oh-so-true of people who know a score too well but can’t be on stage). Arbuckle also develops simmering chemistry with Rider-Shaw, which is thrilling even if it undermines her relationship with Billy Lawlor. Note: I went looking for a photo of Golemba as Andy. True to form, the festival didn’t have any. I’m crying foul. Again. Billy is played by the endlessly charming Kyle Blair who proves himself an astounding triple threat with a crazy tap number to match the caliber of his soaring voice and comedic chops (or at least come pretty close). Alex Sanchez’s choreography is splendid and the brilliant chorus tackles it flawlessly. They’re led by Kyle Golemba who, after entirely too many years in the chorus himself, has finally been promoted to the small but crucial role of Andy Lee, the choreographer of the show-within-the-show. Despite his strong voice, Golemba’s dancing skills are likely what’s kept him in the chorus because it simply seems a shame to have him in 42nd Street and not use him in the tap numbers. Luckily, Andy is the perfect part that actually gives him something to do beyond dancing while still showcasing his outrageous dance skills (you won’t quite believe it until you see it- he’s talking, he’s checking a clipboard, he’s doing it all while tossing out some truly impressive taps that don’t seem to affect his upper body). Both standout triple threats, the Kyles (a real life couple) together form a dream team of voice first, dance second (Blair) and dance first, voice second (Golemba)- both amazing. I’d gripe about 42nd Street’s lack of substance but Sean Arbuckle conjures enough of it seemingly out of thin air that I don’t feel the need to gripe. 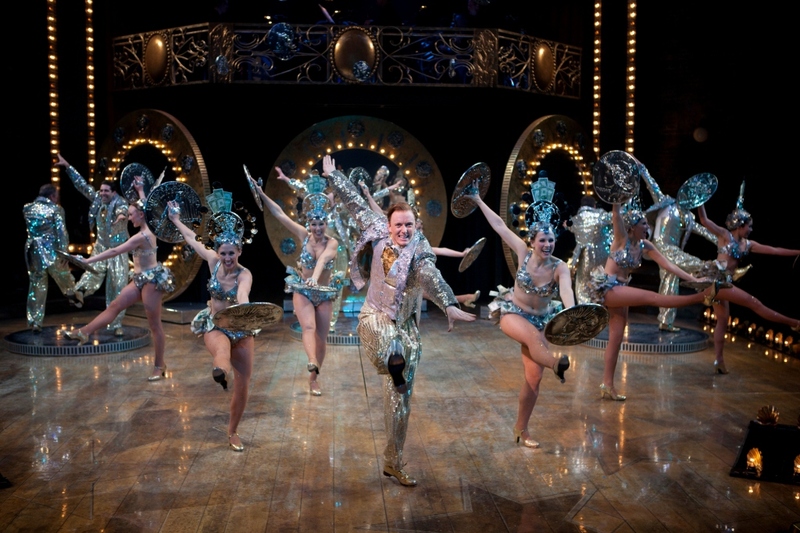 42nd Street is a hoot and nothing less. The only complaint I can think of (and this actually really does bother me) is that the company brought out Dale last at curtain call. She’s far from the star and her being a “famous name” shouldn’t affect that. This show belongs to Rider-Shaw, Arbuckle, both Kyles, the astounding chorus, and choreographer Sanchez. 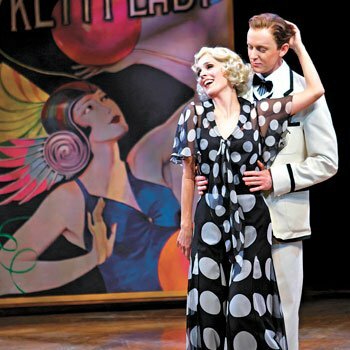 As is, ironically, pointed out in the actual story of 42nd Street– the one no one was paying attention to because they were distracted by all the crazy dancing- celebrity power and star power aren’t the same thing, and shouldn’t be treated as such. 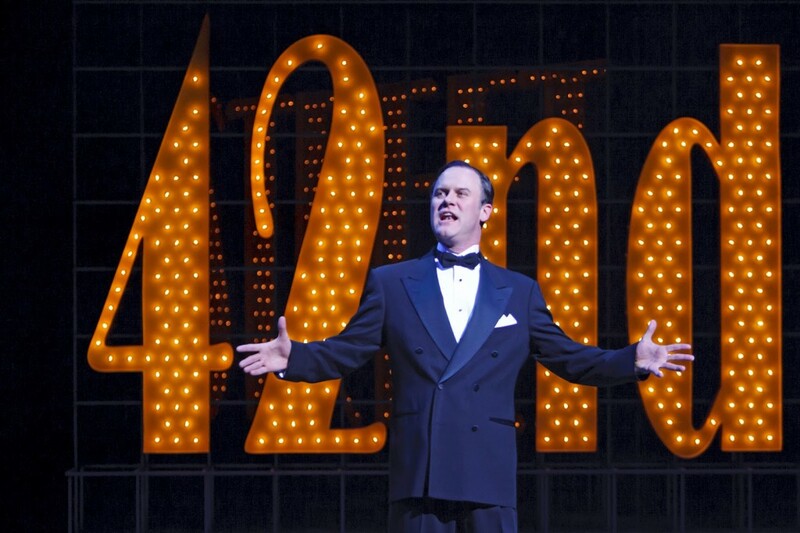 42nd Street plays at The Stratford Festival Theatre until October 28th.